I am more than missing these things, I am daydreaming about them! By this time of the year I have usually been camping, more than once! But my crazy work schedule and wedding busyness is keeping me from my regular life. So if I cannot be camping, I can be sharing with you the things that I love and miss about it. A camping trip always stars with lists. 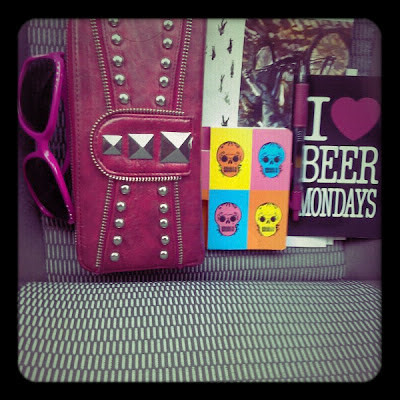 This little skull notebook is one of my fave notepads to make lists in. I gotta admit I actually enjoy the reputation I have earned as bringing tons of stuff camping, hey, I use all of it! Some of my friends even lovingly call me “Stackhouse”, referring to how I always bring a stack of stuff. Forcing this guy to take pictures with me. Oh my god, I love him so much. Falling asleep to this view. Old messages carved into trees. Chilling with the homies/ Creeping on the homies. Flip flops on river rocks. Super sweet romantic and creative surprises from my man.